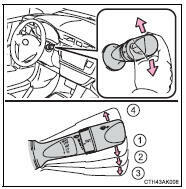 The wiper operation is selected by moving the lever as follows. When intermittent windshield wiper operation is selected, the wiper interval can be also adjusted. *3: The interval adjuster may not be equipped depending on the grade. 7 Washer/wiper dual operation Wipers will automatically operate a couple of times after the washer squirts.